Madhavendra Puri was the spiritual master of Ishvara Puri - the spiritual master of Lord Chaitanya Mahaprabhu. Srila Madhavendra Puri established the worship of the Gopala Deity, who is today worshiped as Srinathaji. Advaita Acharya was also a disciple of Madhavendra Puri. It was Madhavendra Puri who introduced the conception of madhurya-bhava (conjugal love) into the sampradaya (bhakti tradition). In this conception, the worship of Radha and Krishna in separation represents the highest level of devotional service. Madhavendra Puri's samadhi (shrine) is in Remuna, Orissa. Srinivas Acharya was a member of the party that first brought the books of the six Goswamis from Vrindavana to Bengal and Orissa. 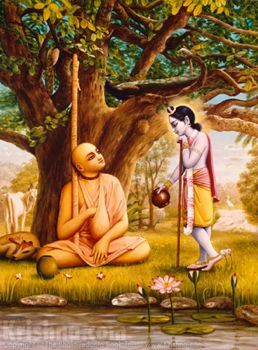 He converted King Birahambira to the Vaishnava religion and helped organized the first Gaura Purnima festival, celebrating the birth anniversary of Lord Chaitanya, in Kheturi Gram. 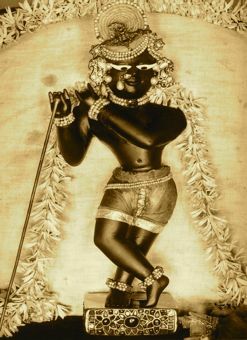 Sri Sri Radha Raman is a self-manifesting (not carved) Deity of Krishna Who was worshiped by Gopal Bhatta Goswami, one of the prominent followers of Lord Chaitanya. He is still worshiped today in Vrindavan, India. Video: Gopal Bhatta Goswami and Sri Sri Radha Raman, with Chaturatma dasa.